I cherish my gal pals. There is just something so special about women sharing wonderful friendships with other women. I am fortunate to have a smattering of strong, smart, loving, funny female friends in my life. They come in all shapes and sizes, all ages, and from diverse cultural, economic and educational backgrounds. They are so very dear to me and I can’t imagine my life without them. 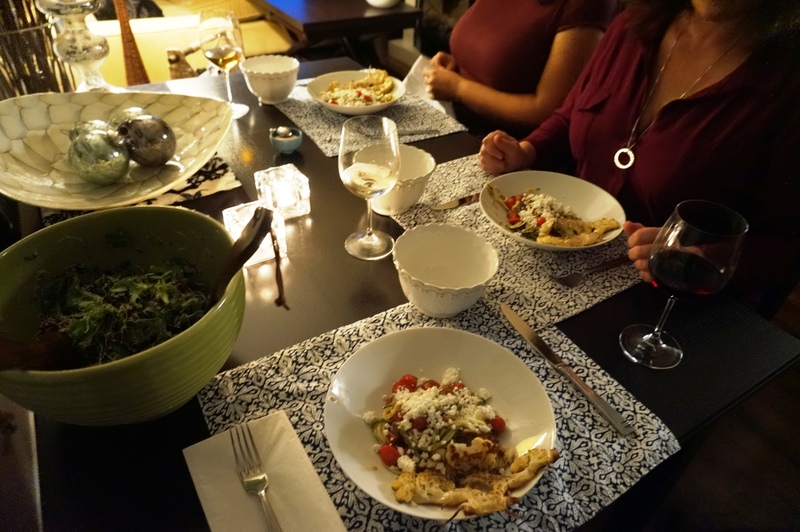 Two of the girls from this beloved bunch came over for dinner the other night and I thought I’d share a few photos of the simple but awesome meal we shared. We started with a humble appetizer. The goal was to avoid ruining our appetites, so the pickings were wee. 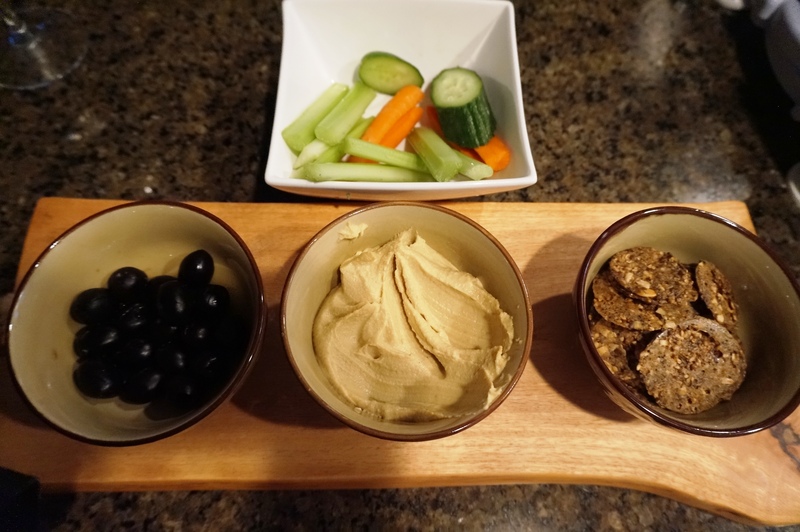 A little garlicky hummus, savoury olives, seed crackers, and vegetables (we had already noshed on a bunch of these, as you can see). 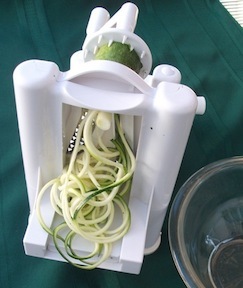 I then performed a little culinary display at the kitchen counter, cranking out zucchini noodles on my talented tool, the spiralizer. First of all, for our supporting side, I sliced cauliflower ‘steaks’ from a good-sized head of this cruciferous gem. I lay them on a baking sheet, slathered them in coconut oil, sprinkled Himalayan sea salt and freshly-ground pepper over top, and placed in a 350 degree oven for about 45-50 minutes until golden brown. Yum. For the zucchini pasta entree, I sauteed lots of finely-diced red onion (about 1/2 of a large one) in a roomy pan with about 2 tablespoons of extra-virgin olive oil. Once softened, I added 4 finely-diced garlic cloves, and an entire small container of organic grape tomatoes, halved. I sprinkled in sea salt and pepper to taste. 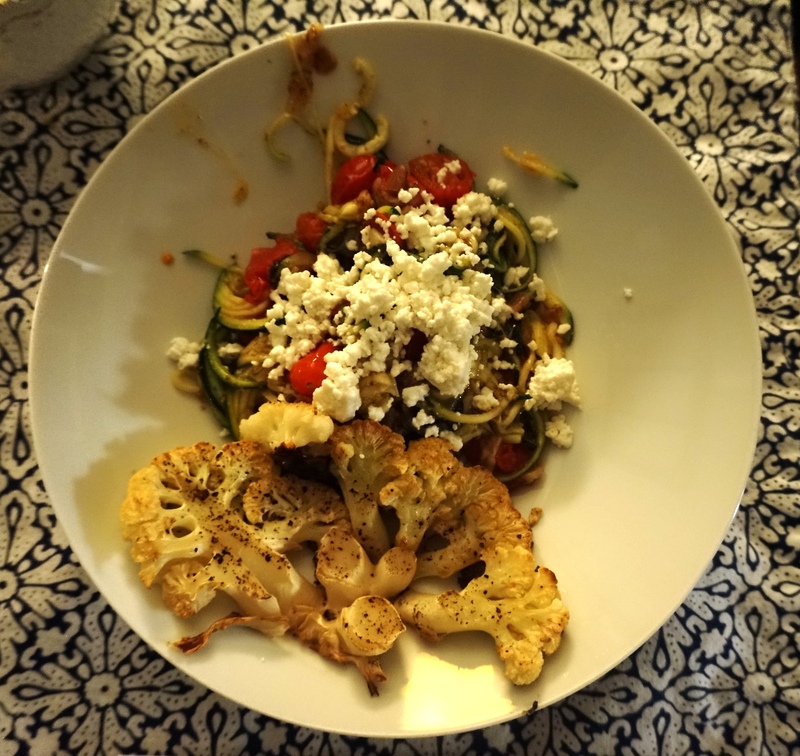 After a couple of minutes, I added the zucchini noodles that I had spiralized earlier, and gave the pan contents a quick stir and a toss. I also threw in about a tablespoon of ground flax seed to sop up some of the juices and bring it all together, so to speak. 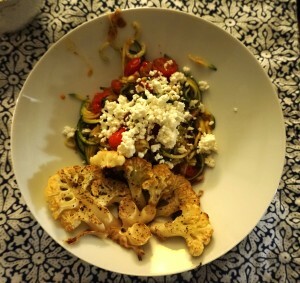 I plopped the goods into our bowls, dropped a handful of crumbled goat cheese over top, and garnished with cauliflower steaks. Yes. This was pretty awesome. Of course, we enjoyed a trusty salad alongside this treat. Mixed greens, alfalfa sprouts, a bit of diced red onion, more halved grape tomatoes, a small diced avocado, pumpkin seeds, and hemp hearts tossed with the juice of half a lemon and a sprinkle of sea salt made for a hearty and scrumptious side salad. Oh, but it didn’t end there! Dessert had been whipped up in the food processor earlier that day – Raspberry Avocado Mousse. I found this recipe in a back issue of the alive magazine. Lots of talking. Lots of eating. What a perfect evening!